When we heard that Ryan La Sala’s debut novel was marketed as Inception meets The Magicians, we couldn’t help but get excited. 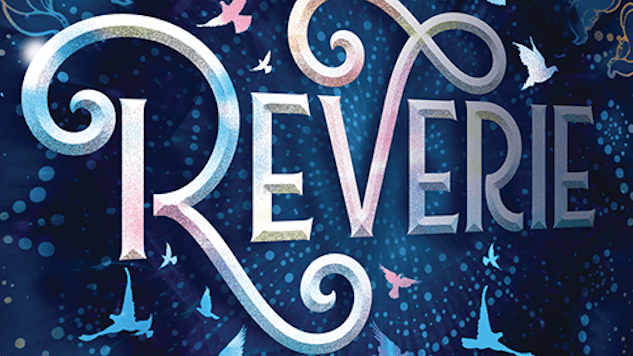 Reverie, coming in January 2020 from Sourcebooks Fire, follows a gay teenager with amnesia who is haunted by a drag queen sorceress. Promising a genre-blending, magic-filled thriller, it sounds perfect for fans of Young Adult authors like Zoraida Córdova and Daniel José Older. All Kane Montgomery knows for certain is that the police found him half-dead in the river. He can’t remember anything since the accident robbed him of his memories a few weeks ago. And the world feels different… reality itself seems different. So when three of his classmates claim to be his friends and the only people who can truly tell him what’s going on, he doesn’t know what to believe or he can trust. But as he and the others are dragged into unimaginable worlds that materialize out of nowhere—the gym warps into a subterranean temple, a historical home nearby blooms into a Victorian romance rife with scandal and sorcery—Kane realizes that nothing in his life is in accident, and only he can stop their town from unraveling. Read on, and check out La Sala’s website to learn more ahead of the January 2020 release. You can pre-order the novel here. This is where it happened. This is where they found Kane’s body. It was on the verge of September, and the Housatonic River was swollen with late summer’s weeping. Kane stood among the bishop’s-weed frothing at the bank, trying to imagine what it’d been like the night of the accident. In his mind, being pulled from the river would have been violent. Moonlight sliced to confetti on the black, broken water as paramedics wrenched him up. But this river, during the day, seemed incapable of violence. It was too slow. Just gold water marbled with pollen, kissing his bare legs, and a fleet of silvery fish slowly wreathing his ankles. Kane wondered if the fish remembered that night. He had the urge to ask them. He remembered none of the accident himself. All that he knew, he’d learned in the five days since waking up in the hospital. Something struck his head. A pinecone. It bobbed into the water and the silvery fish vanished. Kane blinked, turning to Sophia. She stood on the bank where the weeds pressed up through crumbling pavement. He considered ignoring her, but she had several more pinecones and was a good shot. Actually, Sophia was a good everything. Just one of those people. Kane normally resented people like that, but she was his younger sister. He adored her. And he was intimidated by her, just a little. Most people were. That’s why he’d brought her along today. Kane winced. Confused. When he first woke up in the hospital after the accident, when he first realized he was in trouble, it seemed like a good idea to hide behind that word until he could figure out what was going on. The police were asking questions, and the few memories he had from the accident barely made sense. He was confused. But now the word felt like a friend he couldn’t un-make, always popping up to embarrass him. Discredit him. She was right. He had been acting pretty terrible since the accident. Avoidant. Gloomy. Brittle. But these were things Kane had always been. It was just that now people were looking to him for explanations. They wanted answers, or at least to see a brave survivor of something terrible. Instead they saw Kane: avoidant, gloomy, brittle. No one liked it. Staring across the lot at the charred remains of the old mill, Kane’s mind went blank. He’d spent every minute since waking up wondering the same thing. The whole county? Everyone, all at once? Kane imagined the entire population of East Amity, Connecticut, piled into a jury box. It made him smile. Another pinecone struck his shoulder. He trudged back to the bank, letting his feet dry on the baking pavement as Sophia took pictures of the bridge. Then his feet were dry, and he couldn’t stall any longer. They stared at the mill. Kane shrugged. It definitely wasn’t safe. Half imploded, the mill sat quarantined behind a web of caution tape. Behind it, rising through the young birch forest, stood the rest of the old industrial complex: a maze of abandoned factories and warehouses that represented the height of East Amity’s manufacturing era. They went on for miles, proud and forever, slowly decaying beneath neglect as the forest grew up under them. This place was called the Cobalt Complex. This building before them—the old mill that looked onto the river—was the crash site. The crime scene. The cherished bit of Connecticut history Kane had rammed a Volvo into, which then exploded, one week ago. He didn’t even think cars really exploded on impact. That was movie stuff. Yet the mill, and everything within fifty feet of it, was scorched. Kane laced up his brown leather boots. The old mill was a symbol of East Amity, appearing in the watercolor postcards sold all around town. Kane imagined the watercolor version of his crash. The dotted glass on the pavement. The inferno rendered in pale, tasteful shades of apricot. Greasy smoke eddying upwards in violent, lovely twists against the restrained lavender of sunrise. Very pretty. Very New England. “Come on, Kane, focus,” said Sophia as she dragged him under the tape. No new memories came to him in the chilled shade of the mill. Instead came an itch, the sort that simmers through your veins. An instinct. It had been crawling beneath Kane’s skin since they got here. It said: You should not have come back. Kane stood his ground. He needed answers, and he needed them now. Sophia sighed. She prodded a blackened beam. They laughed, and for a second, Kane wasn’t full of dread. Sophia hopped over a mess of broken bottles to join Kane on a crumbling sill that overlooked the river. They sat in silence in the mill’s stagnant air until Sophia hugged his shoulder. This surprised him; she hated hugs. A stitch of guilt pulled tighter in Kane’s chest. He agreed that being okay was what mattered most. He just didn’t agree that okay was what he was. Kane smiled. His fingers itched to feel the tidy network of burns that wrapped like a crown around the back of his head, from temple to temple. They perplexed the doctors. They were shallow and would heal quickly, but sometimes at night they prickled with heat, turning his dreams to smoke and ash. A gust dragged across the river, hit the shore, and floundered against the hemlocks and birch. “Have you talked to anyone from school?” Sophia asked. Sophia let this go, and he was thankful for it. In the past, Sophia had taken it upon herself to conjure him a social life, which she assured him would do wonders for his self-esteem. Wonders! always said with jazz hands. It was a well-intentioned hobby of Sophia’s but had always deeply embarrassed Kane, who did not think he had low self-esteem to begin with. He just wasn’t like Sophia, who needed to befriend everyone and everything. No, Kane liked to think of himself as Discerning! with jazz hands. And besides, if he truly wanted to, Kane could talk to people. But why risk it? It felt unnatural. It was better to resign himself to safer companions: dogs, plants, books, and Lucia the lunch lady, who gave him extra fries on Pizza Tuesdays. The cicadas simmered through the silence, an invisible crowd gossiping around them. Kane had to be careful with his words now. Sophia had asked a question without asking it. “I wasn’t trying to kill myself,” he said. Kane could feel each jagged edge of denial in his throat. He tried to force it up but it cut and clawed. He just knew. Of everything, this unsettled Kane the most, as though he could feel the grip of ghosts upon his flesh. He felt the way the mill looked: history, in smithereens, haunted with the sort of shadows that squirm. A familiar sense bristled over Kane. Sophia had always thought of him as a bit of project. Had she made investigating the accident her latest focus? Did she know more about this than she was letting on? Kane might have noticed Sophia look away too quick if he wasn’t watching a shadow behind her break away from the wall and scamper, huge and spider-like, across a doorway. “Something’s in here,” he whispered. Just then they both heard a creak on the stairs—the cry of the fifth step. Whoever it was must have known they’d given up their position. The mill shook as something large and fast thundered up the stairs and burst onto the second floor. Kane and Sophia dashed into the closest room—one with a vaulted ceiling blackened by soot, a floor rotted through, and a heavy metal door. Kane swung it shut and slammed down the latch a moment before something rammed into the other side. The hinges screamed, but the latch held. Again and again something tried to muscle through, the ceiling releasing clots of dust each impact. Then came the awful sound of metal scraping metal. A key, maybe? Or claws? “There!” Sophia pulled Kane toward a window leading onto a roof so badly damaged it looked ready to cave in. Together they picked across sagging beams and shimmied under them. Inside the building, the shadows boiled—unreal, massive shapes that scuttled through the darkness below, tracking them. He caught Sophia’s wrist just as her leg plunged through a rotted portion of the roof, but their weight was too much. In a plume of dust and decay, the roof tilted beneath them, throwing them down so hard Kane’s teeth snapped together. They were…outside? They’d tumbled over the mill’s back edge. Around them shivered desiccated ferns bathed in thick yellow light. Behind them the structure continued to shake ominously. Kane’s hand found Sophia and they ran, crashing through the forest of scorched saplings as a portion of the mill collapsed completely. Splinters showered their backs. Kane threw a glance over his shoulder and saw a towering shadow printed upon the rolling cloud of dust and ash, so tall it could have been a tree. But then it turned and, finding them, lunged after. Kane focused only on keeping up with Sophia as they shot into the Cobalt Complex’s sprawling maze of ancient buildings, pitted roads, and equipment overgrown with ivy, to the edges where rotten fences held back the forest. They’d hidden Sophia’s car in the neighborhood that backed up against the mill, behind a wall of mountain laurel. The sound of sirens cut into Kane with the finality of a guillotine as a police cruiser rolled out of the shade, stopping before their idling car. Sophia let lose an elaborate string of bad words. Kane’s mouth was dry. He nodded. The world went wobbly beneath him. He grabbed the car’s hood to keep from falling. What the hell were those things? There was no way to describe them and no point in doing so. The police wouldn’t believe any of it. They would think Kane had caused the damage to the mill himself. Again. The officers eyed Sophia incredulously. Her hair, the color of cocoa powder, had come unbraided and floated around her jaw, a few strands caught in glistening spit at the edge of her frown. She had on her Pemberton uniform—the all-girls private school in town, which was an honorable and mysterious institution that gave all the locals a superstitious pause—but it was a mess from their run. Still, the cops paused.